As secretary of the Swellendam Heritage Association it is always with great gusto that we plan an outing or event and in some cases a talk or lecture. Naturally you worry about whether anyone in the world will actually attend the event as the market for a sheep shearing experience is presumably quite small. But time after time the numbers surprise us as it seems that there is a real interest in who we are in terms of where we have been. 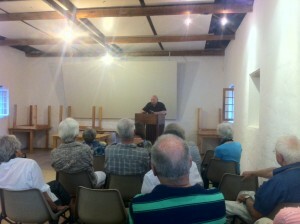 This time it was the turn of Dr Tertius Weich to talk about his experiences living in Swellendam since the early 50’s. And he has seen a lot. From the much lamented and regrettable removal of the oak trees to widen the main street to the removal of families to comply with the Group Areas Act. Dr Weich is a family doctor (now retired) and his joie de vivre is apparent to all. We invited our German guests to join us at the talk and they liked it a lot. As Frankfurt bankers, they really enjoyed seeing a different side to Swellendam and the general small-town-SA character. Having already met Miemie Rothmann who immediately identified them as German before they even said a word (we are convinced that she has a rare gift) and then in perfect German waved them into the hallowed halls of the Swellendam Drostdy, they were pleased as punch with their Swellendam experience.